If the right conditions apply, you could get your money back if your currency is destroyed. 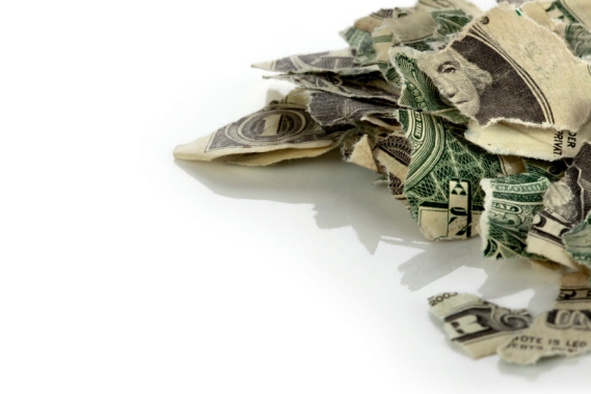 We’ve all heard the excuse, “My dog ate my homework,” but what if the dog ate your $100 bill? If Fido only ate part of it, you could get all of it back courtesy of Uncle Sam. The U.S. Treasury examines more than 30,000 claims of mutilated currency every year. From those 30,000 claims, it redeems more than $30 million of mutilated currency. What can be considered redeemable mutilated currency? According to the U.S. Mint, a coin is considered mutilated if it is “bent, broken, corroded, not whole, melted together and not machine countable.” When it comes to bills, however, things get a bit more complicated. If you have a note that is missing more than one-half of the original note, or if the value of the note is unclear without special examination, you may have mutilated currency. Additionally, if currency has become spoiled through fire, water, chemical, explosive, animal, insect or rodent damage, it may be mutilated. Money can also be mutilated by being buried or through petrification. Petrification occurs when a note deteriorates to such an extent that its organic matter has slowly been replaced by dissolved minerals. To be considered mutilated in these cases, either more than 50 percent of a note must be identifiable as U.S. currency, or less than 50 percent of a note may be identifiable as U.S. currency if the method of mutilation and supporting evidence demonstrate (according to the U.S. Treasury) that the missing portions have been totally destroyed. Otherwise, you could be hiding the missing pieces away at home to exchange at the bank in an attempt to double your money. What does not count? Any damaged currency where more than one-half of the original note is clearly present, and it does not require special examination to determine its value, cannot be redeemed as mutilated currency. If you have a note like this, your local bank should be able to give you a new bill. How can I redeem my mutilated money? If your cat has been sharpening its claws on your purse, or your dog has been using your wallet as a new chew toy, all may not yet be lost. Likewise, if you find remnants of currency in your vacuum cleaner’s dust bag after cleaning your teenager’s room, it could turn out to be a windfall, as it is possible to redeem mutilated money. All mutilated notes must be sent to the Bureau of Engraving and Printing, a division of the U.S. Department of the Treasury, where it will be meticulously examined. In addition to your claim, you should include an estimate of the currency’s value and an account of how it became damaged. Due to the often-fragile nature of mutilated currency, it is important to take care when preparing your parcel for submission. The Bureau of Engraving and Printing recommends that you minimize your contact with fragments of mutilated currency to ensure preservation. Wrap the currency carefully in plastic and cotton before sealing it in a secure container. If the note was rolled up when mutilated, do not straighten it out. Similarly do not fold currency that you found flat. If you found mutilated notes inside a container, such as a wallet or a box, you should leave them there to reduce any risk of further deterioration. If you have already removed the pieces from the container, send the whole package to the bureau, including anything else that was in the wallet. It is in your best interest to insure the parcel and send it by registered mail. The Bureau of Engraving and Printing will only issue a written confirmation of receipt if the evaluation is expected to last more than four weeks. For added peace of mind, you could deliver your mutilated currency personally if you don’t mind travelling to Washington D.C. The Office of Currency Standards accepts deliveries from 8 a.m. to 2 p.m. every weekday (apart from holidays of course). You can find them at 14th and C Streets, S. W.
Once your parcel has been delivered, you can check the status of your claim by emailing MCDSTATUS@bep.gov or calling the toll-free line: (866) 575-2361. Considering the effort involved, we recommend you rethink submitting a mutilated currency claim for a mere one or two dollars, as the cost may far outweigh the benefit. On the other hand, if you think your fragments are worth a few hundred or thousand dollars, send it in, and hope for the best. If your pet has been chewing on coins as well as bills, a visit to the vet may be in order.